Most of my life has been lived in a golden shimmer of love and privilege. I’ve been lucky in more ways than people can imagine. And intertwined through that iridescent daydream, was the illusion of control. When my mother died suddenly on September 5th, 2006, everything changed. I thought that parents were forever, but when mine vanished, I realized that nothing really was. Obvious to most perhaps, but not me. The future suddenly acquired a finite horizon line. It became frightening. A shadowed landscape, filled with uncertain paths and unexpected storms. I became apprehensive. What other dark and sudden turns lay ahead? I decided that rather than wait helplessly for my future to arrive, I would confront my fears. I would try and anticipate my fate. Guess at the abrupt and unforeseen directions my life might take. Photography is always about the past. The moment picture is taken; it’s behind us, in history. This project is about the future-but how do you research what has not yet occurred? I took a DNA test that told me what illnesses I’m likely to get. I consulted with fortune-tellers, tarot card readers, numerologists and palm readers. I researched insurance company statistics. I took acting lessons, to learn how to move as an old man of 90, or a large man of 55. Finally, working with a skilled prosthetics expert, I made images based on my research. And something extraordinary happened. The project became an exorcism. 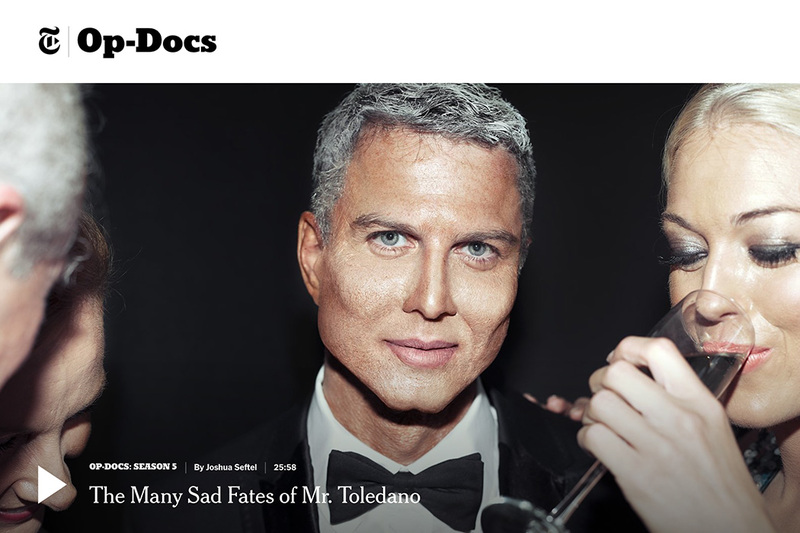 Watch The New York Times documentary The Many Sad Fates of Mr. Toledano.